Did you read yesterday’s blog post? I made a little announcement + some changes to the SHOP THE POST section. You don’t want to miss it! Ever since I booked by return flight to London last month, I’ve been dreaming about all the things I’ll need to take with me. Everyone keeps asking me, “how are you going to pack? !” – it’s a valid question, especially since I’m going to be gone for several months. While I imagine I’ll be checking several bags, I am likely going to ship some of my heavier items before I head out the door: outerwear + chunky sweaters, jeans, and boots. As I’ve mentioned since 2015 started, I have made an effort to simplify my wardrobe and try to only buy the best of basics that will last me a long, long time. This has proved a great strategy for outfit planning while abroad. I won’t be taking many prints or crazy pieces. You can expect lots of neutrals, black and classic silhouettes that can be re-imagined with different hero pieces and accessories. One piece I recently picked up in preparation for my departure is this new pair of Burberry rain boots (buy them here if you’re in the UK!). I was immediately drawn to the cool belt buckle detail on these boots. Even with that extra detail, they’re simple enough to wear with pretty much anything. Just what I need for those rainy days! Now all I need a classic black raincoat! Looking for more? Click here to view past EDITS. These rain boots are perfection, I need to find a short pair with all the rain we are getting now. OMG! 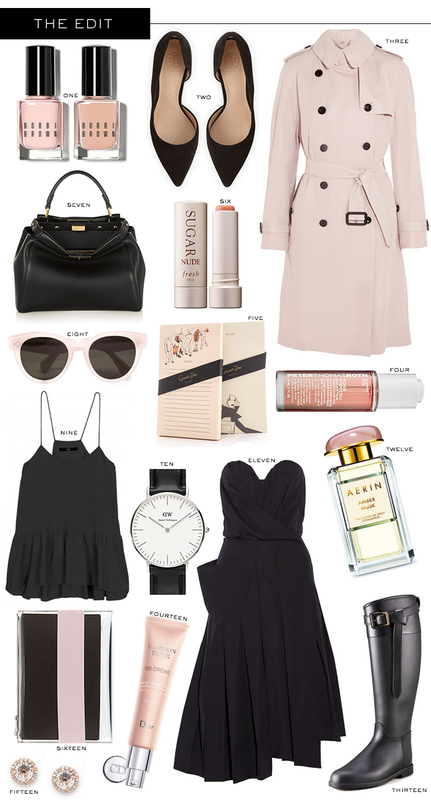 Love the pastel pink trench coat- so, so pretty! Black and Blush are my absolute favorite combo! I need to just finally get myself DW watch I love them so much! Love those boots! They really are simple yet beautiful! there is not one thing here that I don’t love! I’ve had my eye on that tibi top for a while. Gorgeous edits! The Amber musk is my favorite scent! Love all of the picks here too! Your philosophy is great, invest in the best! You know I am a sucker for this color palette, everything is just beautiful! Just loving that pale pink and the very simple watch! So perfect for this chilly spring.